These seven pieces of equipment can be beneficial in any home gym setting. The dream home gym doesn’t have to be a dream when there’s careful curation and planning involved. In fact, a home gym can pretty much be a possibility for everyone to some extent, sans some apartment dwellers who have virtually no room (although, that doesn’t have to stop you!). If you are fortunate enough to have ample space for lifting equipment, then now might be the best time ever to build your dream home gym. Besides the obvious benefits of owning a home gym, building a home gym can be a very empowering process. Think about it, you are basically cultivating a space that is going to facilitate a ton of personal growth. A space that you’ve always dreamt of when you walk into private and commercial gym. So where do you begin? Today, we’re going to cover some home gym essentials, or the pieces of equipment that every home gym can benefit having. Instead of listing plates and a barbell separate, we are going to rope them into one entity. After all, a barbell is great, but it will only be useful up until you need to load it with plates to get stronger. This dynamic duo is essential for any home gym because there are so many things you can do with a barbell and plates. When most think of a barbell and plates their mind goes to the squat, bench press, and deadlift. While these are inherently three of the biggest movements you can do with this equipment, they’re certainly not the only exercises. If you want to train a body part, literally any body part, there’s often a way to do so with a barbell and plates. 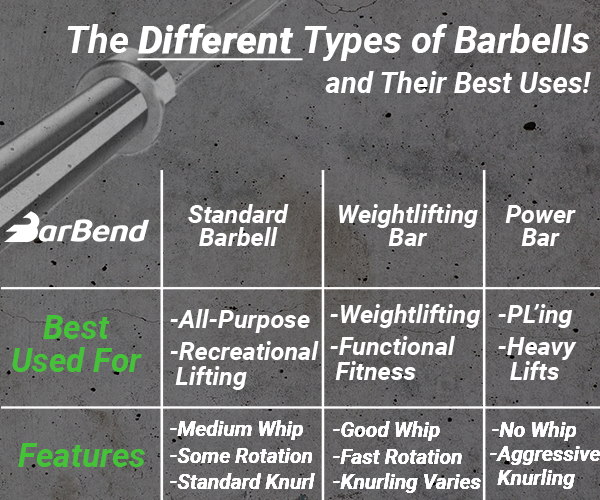 Now the question remains, what is the best barbell? And which plates are best? Those will depend on your individual needs. Our advice, consider the style of lifting you do and then dictate which barbell and plates would suit you best. For example, if you’re weightlifter and drop plates, then go for a bar with good rotation and bumper plates. A squat rack or stand is for much more than the athlete who likes to squat a lot. Consider this piece of equipment the focal piece of your home gym, this piece of equipment is the belle of the ball. You can be as creative as you want with your squat rack or stand, and more than likely your pick will complement your main lifting style. 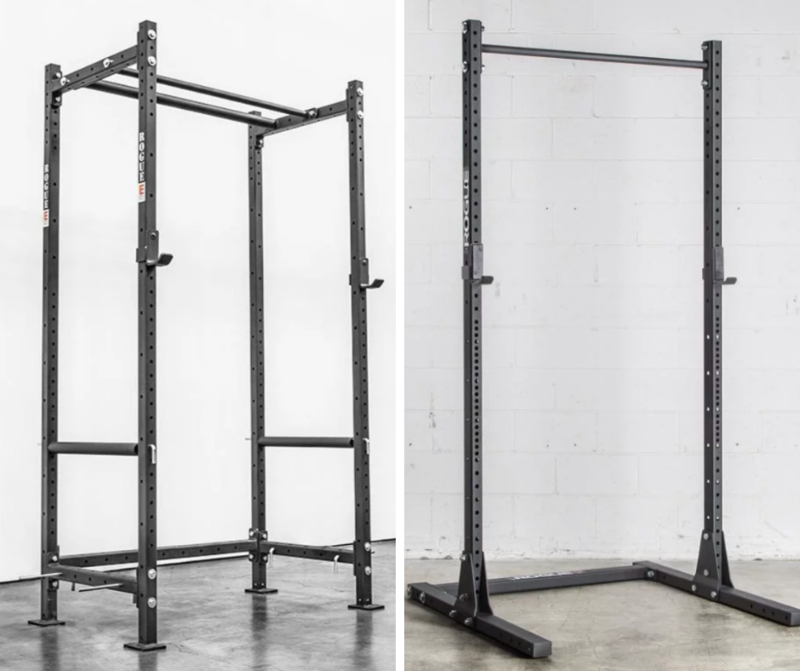 The real question one should ask themselves is which rack or stand would be best for their needs, as squat racks and stands come with their own sets of pros and cons. Typically come with plate holders. Sometimes include a pull-up bar, or variations of bars to do pull-ups from. Usually more sturdy than a rack. Can be expensive depending on the level of the rack. Great for saving space in a crowded home gym setting. Somewhat limiting with functional use. If you’re considering a squat rack and stand, then we’d recommend using two guidelines to make the right choice. First, consider your budget and how much you want to spend. Second, measure how much space you have and if a rack and stand can accommodate your needs. Medicine balls and sandbags are earning our third spot on our home gym essentials checklist. Why? Well, neither medicine balls or sandbags require much space for storage and they’re incredibly dynamic. There’s a reason both of these implements are used so often in functional fitness workouts. With a medicine ball and sandbag you can virtually train any part of the body and do so in various ways. Pro: Great for training power focused movements. Pro: Useful for versatile full body workouts. Pro: Easy to transport and store. Pro: Easy to transport and store. Con: May be too light weight for some exercises. Con: Durability issues can cause messes. Con: Environment could limit workouts. Con: Slightly more expensive than medicine balls. The pull-up bar is making our fourth spot on home gym essentials list. A pull-up bar is a staple in a vast majority of athletes workouts and it’s great for three reasons. First, it’s a cost efficient option that can work in pretty much any home setting as long as you have a door frame available. Second, pull-up bars can encourage day-to-day workouts since they’re often always readily available, so you can do reps every time you walk through the doorway. Third, it’s an easy tool to track progress with by performing various amounts of reps with each passing day. 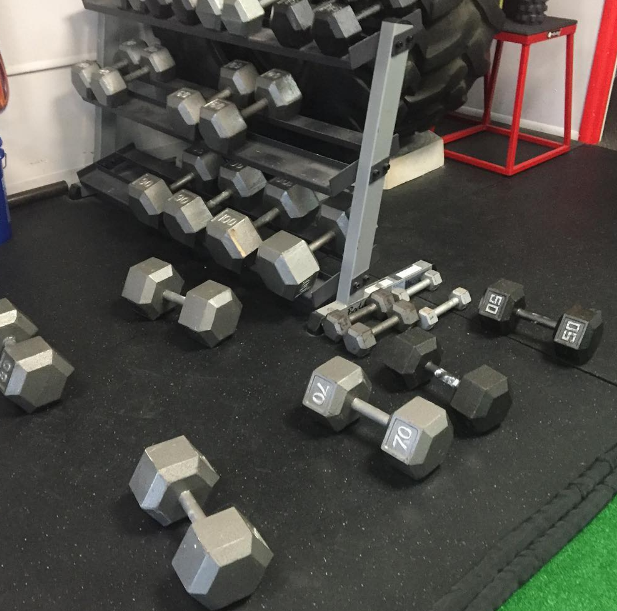 A home gym checklist wouldn’t be complete without a few dumbbells. The great thing about dumbbells, besides their versatility, is that you don’t need to purchase a whole set to reap their benefits. In fact, you can buy as few or as many as you need based on lifting goals, space availability, and budget. This makes dumbbells a great option for apartment dwellers and cost efficient home gym owners. If you like the idea of dumbbells, but want something slightly more dynamic and versatile, then kettlebells are a great option. Kettlebells come in multiple forms and can easily stored. They are also great options for anyone with limited space, as even power-focused movements like kettlebell swings and snatches require minimal room to perform. Kettlebells come in multiple options and can match any fitness-based need. Another great home gym essential is the TRX™ suspension training system. Yes, the TRX systems might not help you pack on pounds of muscle, but they’re great for easy transportation, full body workouts, and storage. If you’re limited on space, or need a tool to achieve casual weekend workouts, then the TRX home gym systems could be useful for you. Not to mention, the TRX’s use is literally only capped by your creativity, so you can train virtually any body part with them. Building out a home gym doesn’t have to be a pipe dream when careful steps are taken to do so. In reality, a home gym only really needs equipment that you’ll be using all of the time, so making a checklist is great starting point to bringing your vision to life. Hopefully this home gym essentials checklist provides you with some inspiration and ideas for building your dream home gym.